The weather was as bad as it had been all day. I looked out through the small, eye-level window in the hangar door, where, in the illumination from the high-intensity lights that surrounded our two helipads, I could see waves of water surging across the concrete. This was going to be the most agonizing go, no-go decision of my thirty-five year flying career. Casey Ping was no longer around. A few minutes earlier, he had left in his Suburban to go pick up Stef Maier, who was still stranded at Brackenridge Hospital. My crew and I were the only ones remaining at the hangar, which was okay by me. It gave me a welcome measure of solitude in which to make my decision. A few years earlier in my career, I would not have had the confidence to fly in a storm of this magnitude. A few years later, after I had become wiser and less bulletproof, I would have cancelled this mission in a heartbeat. For starters, I wasn’t flying with my regular crew that night. This would be Chris’s first rescue as a crew chief, and she and I had never even trained together, so I had no way to know how well she could actually function in that role. Not only that, she had already been on duty for eleven hours. As for Jim, he had worked a full day in his office. It was anyone’s guess as to how fatigued he was by that point. As if that wasn’t enough, because I hadn’t been expecting to fly that night, I had spent most of the day turning wrenches on my truck. 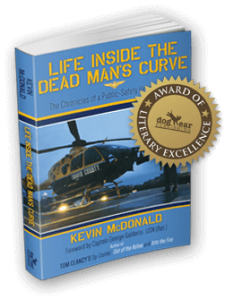 Leaning my face toward the tiny window in the hangar door, my hands and elbows resting against the cold metal surface, I could feel it shuddering from the wind and rain on the other side. As Jim and Chris patiently waited behind me, I closed my eyes and quietly gathered my thoughts for what must have been a full minute. It wasn’t just my life on the line. There were two more people, standing right behind me, who were depending on me to make the right call. Spanky Handley, who was my boss, had turned down two rescues at Shoal Creek just an hour earlier, and I had already cancelled one for weather myself. Jim and Chris probably figured I would cancel this one as well. Still leaning against the hangar door, eyes still closed, I lowered my head. I reached with my right hand and nervously rubbed my hair back and forth. Then I pulled forward and down against the back of my head until my chin was resting firmly against the top of my chest. I thought about the other people who were depending on me to make the right call—the three people in the water. They were seven minutes away from us, straight up FM 685, barely more than a takeoff and a landing from the hangar. It felt as if I was trying to process a million thoughts all at once, but it ultimately came down to this: Do I launch into the teeth of the storm and place my crew in harm’s way, or do I play it safe and cancel? One thing was absolutely certain. Nobody was ever going to question me if I decided to take a pass in this weather—nobody except for me, that is. No matter which way I chose, there was a chance I would end up regretting my decision. My rational voice was shouting at me, telling me to turn the call down. My naval aviator voice was whispering in the background, telling me this was what I was trained to do. There was no getting around it, this was a moment that could define my career as a public-safety helicopter pilot—or possibly finish it. Head still down, eyes still closed, I took a deep breath and forcefully exhaled. Dammit! I thought to myself. I didn’t come here to spend the whole night turning down calls. If we can’t go get these people when they’re this close to our hangar, we should pack it up and go home. When I opened my eyes and turned around, Chris Jones-Piercy was holding her radio up, waiting to relay my answer to the dispatcher. “Let’s mount up!” I said. Jim Allday hit the button that opened the hangar door, and as it opened, we were instantly drenched by wind-driven masses of rain—blowing straight in toward us.